MADE IN THE USA! This is a fun shirt for a Lineman or Apprentice to wear! 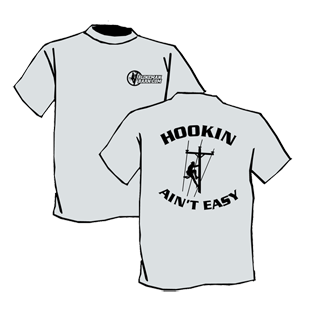 The Hookin Ain't Easy design is printed in black on the back of an ash shirt. 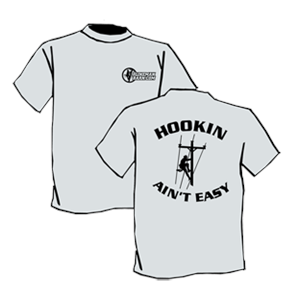 It is very affordable and a great "kickin around" shirt with the same great Lineman Barn quality! 99% cotton and PRESHRUNK for a great fit. IF YOU DO NOT SEE YOUR SIZE IT IS TEMPORARILY OUT OF STOCK AND WILL BE IN STOCK SOON! Got this shirt when it first come out and I can still wear it! It has lasted quite a few years and is still kicking along. Once again great quality material from a quality company! !